Attending an event at the House of Commons organised by the Trigeminal Neuralgia Association UK, together with MPs from all parties, medics and patients, to hear about this little known condition which causes continual intense pain attacks on one side of the face. Parliamentary reception on 11 June to celebrate the impact of UNISON'S 'Violence at Work' charter on the third sector. The British Nuclear Test Veterans Association are running a joint campaign with Tom Watson MP and the Daily Mirror to honour our nuclear test veterans with a medal. 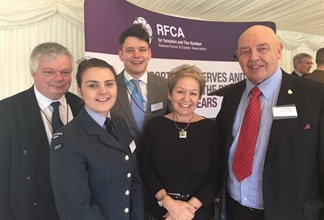 Dame Rosie Winterton showed her support for a new British Red Cross scheme called 'community reserve volunteers' which will create a national network of people ready to help in a local emergency.